In conjunction with Malaysia Day, Berjaya Hotels & Resorts (BHR) organised BHR Family Day 2018, themed “Sayangi Malaysiaku Bersama BHR” with the objective of celebrating the special day in support of unity and patriotism. The event took place on the 15th of September 2018. 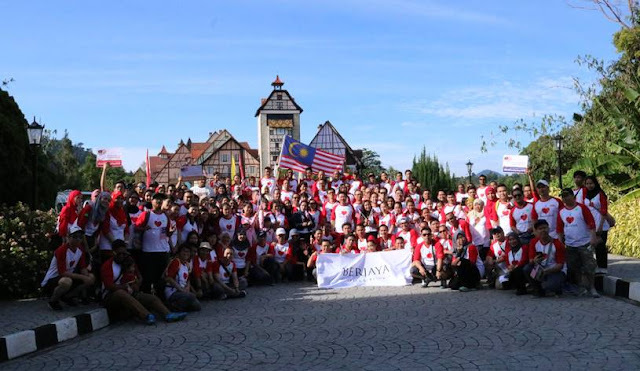 Participants involved were employees from various Berjaya Hotels & Resorts in Malaysia. Around 230 participants showed up to the event which was held within two properties in Berjaya Hills – Colmar Tropicale and The Chateau Wellness Resort. The event celebrates the spirit of Malaysia Day among all staffs involved through a series of fun activities including a 2KM Trail Walk and various games for the kids. BHR in its effort to lift the spirit of patriotism as well as to show support to the Tabung Harapan Malaysia fund, have previously launched the “I Love Malaysia” t-shirt initiative, whereby RM1 from every purchase of the t-shirt will be donated to the fund. Launched in May 2018, Tabung Harapan Malaysia is a fund launched by Malaysian Prime Minister Mahathir Mohamad as a platform to receive the people’s donations to strengthen the government’s finances. The t-shirts are readily available for purchase in all Berjaya Hotels & Resorts’ gift shops and airport lounges in Malaysia at only RM20 each. Alternatively, purchases can be made through BHR’s social media accounts. The total fund collection from the t-shirt purchases stood at RM3,000 as of September 2018. As the host of BHR’s Family Day 2018, Berjaya Hills is proud to welcome fellow employees of Berjaya Hotels & Resorts to the venue. Located in Bukit Tinggi, Pahang, the two properties – Colmar Tropicale and The Chateau Wellness Resort – works collaboratively towards organising the memorable event. The French-themed resort is conveniently located within a 45-minute drive from the Kuala Lumpur City, away from the hustle and bustle of the city, making it an ideal location for the event to take place.